In this addition of Hiro Clix, we explore two powerful witches from Soul Eater, Medusa and her sisters, Lady Arachne and Shaula! Facing their magic alone won’t be easy so also provided is a multitude of weapons to get witch hunting with! Come back later this week to see the rest of the dials! In the world of Soul Eater, witches, demons and other horrors haunt the land killing and eating the souls of innocents. In order to put an end to this, Death himself founded and rules over an academy of people who want to be trained to fight these horrors. Not all of the students are soldiers but some rather transform into weapons to be wielded by other students. Medusa is probably the world’s most evil and selfish person that will use anyone, including her own son, to get her way. She uses snake-based magic to force others to do her bidding and seeks to gain power, greater than Death’s, for her own selfish gain. Medusa opens with a powerful attack and damage with a fair defense and speed. She has a nice amount of free action powers that are always welcomed such as Shape Change, Outwit and Perplex. Medusa holds a few tricks up her sleeve with dishing damage with Penetrating/Psychic Blast and then healing herself with Steal Energy and Regeneration. 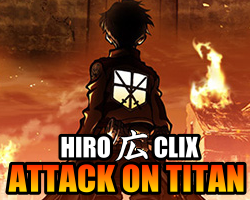 Right: See the Attack on Titan Hiro Clix dials now! Playing with Medusa: Medusa is going to be cautious to enter the field and strike from the shadows. Utilize her great opening by using Penetrating/Psychic Blast while in Stealth. This will force her opponents to come to her. Leave a character with Charge behind her to soak up Mastermind damage and counter her aggressor. Playing against Medusa: Medusa’s greatest weakness is her defense. Sure it is fair in the beginning with an average 17 but when you get past that, she can get squishy. When she reaches that point, you’ll want to strike at her quick to get rid of her use of Perplex, Outwit and healing powers. While these are cool, I was kinda hoping to see some main characters like Maka, Death the kid and Black Star. Hate to say this, but if your doing monsters I expect you to Venom at the least.